Recently I spent some time in Melbourne Australia golfing with my good friend Mark Penfold from Thailand Golf Tours in Sydney. Mark and I got talking about why golf in Thailand is so popular with Australian golfers and what are the biggest differences between golfing in the 2 countries. Here are Mark’s views. While the best golf courses are similar throughout the world in shot values, landscaping and maintenance, the unique points about golf in Thailand come down to 3 main factors. Forget lugging your clubs from your car to the clubhouse. There are not many golf destinations in the world where as soon arrive your clubs are taken from you and the next time you see them they are on a pull cart with a Thai girl smiling and giving you the courtesy “wai” (hello). Then, there is something special about having someone give you yardages to the pin, telling you where the trouble lies, and advising which way the putts will turn. Ever get thirsty when golfing or tired of waiting 1 hour or more for the beverage cart? Well not anymore. During your round there are refreshments stands ever 3 holes full of snacks and beverages to keep you going. Golf in Thailand is designed to be a whole day affair. Start with a warm-up on the grass driving, play 9 holes, (some even stop after 9 have a shower then lunch and continue the back nine after lunch), take a post-game shower, and finish the day off with a massage meal, and drinks. I don’t understand people rushing around during their game, putting their shoes on in the car park and rushing off, golf is a relaxing and social game (at least it was developed to be); so enjoy the round and the golf club facilities when golfing in Thailand. The weather in Thailand is conducive to good golf all year round and with the temperatures around the 25-30 degrees centigrade you can see why the Thailand golf courses are full of golfers all year round in Thailand. You can travel to Thailand anytime and get a game in to beat the cold weather home in Australia. If you prefer a cooler temperature, then golf in Chiang Mai or Chiang Rai where the golf courses are less crowded, less expensive, and the temperature rarely gets above 25 degrees centigrade. 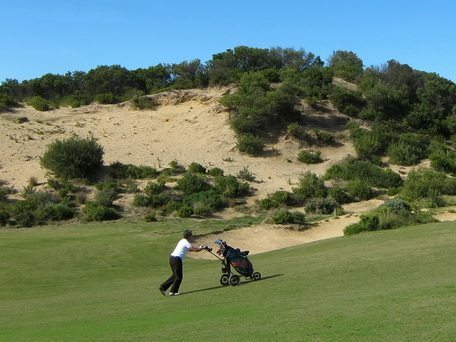 While golf in Australia can be inexpensive on the smaller public courses, to get onto the top 20 Australian golf courses can cost up to A$350 for a round, (no caddy and cart in this price!). You can play at any number of Thailand PGA venues (all top 20 golf courses in Thailand) with a caddy and cart for less than A$100 (and this includes a charming caddie and cart). To top it all off you will have service more akin to a 5 star hotel than any golf course in Australia. Now that is what I call great value! I’m a big fan of playing the best courses, doesn’t matter where I go, so if I’m looking for a great value golf holiday including play some top PGA championship courses, then Thailand is the destination. Golf holidays in Thailand even rivals going away for a week in Australia, especially when you compare the service and quality of the courses, factor in costs such as car hire, food, beverages, and lodging . Throw in some great food, fantastic shopping, daily massages and spas and you even will get your non-golfing partner or spouse wanting to come along. Mark Penfold has been coming to Thailand for 15 years and can be reached at Thailand Golf Tours. He runs several fixed date golf tours a year to Thailand as well as creates tailor-made itineraries for anyone interested in golfing in Thailand.